In front of a live audience, which included His Excellency the Thai Ambassador, at the Amora Hotel Wellington, Avianca Böhm, Miss Howick, has been crowned Miss Universe New Zealand 2012 by her predecessor, Priyani Puketapu. Photos by David Duffy/emotif.co.nz. 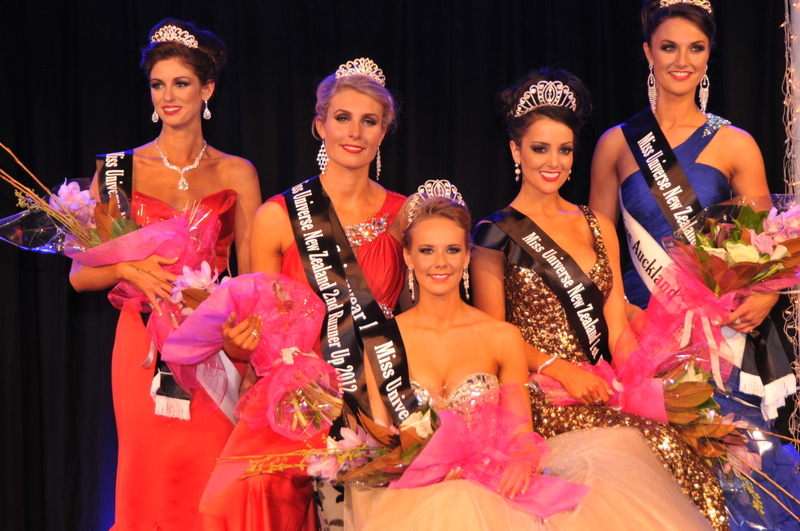 L to R: Monique Cooley (Miss Otag0), third runner-up; Lauren Mann (Miss Wellington), second runner-up; Avianca Böhm (seated, Miss Howick), Miss Universe New Zealand 2012; Talia Bennett (Miss North Harbour sponsored by Tuscany Road), Jennifer Lambly (Miss Auckland), fourth runner-up. First runner-up was Tuscany Road-sponsored Miss North Harbour, Talia Bennett, with Lauren Mann, Miss Wellington, as second runner-up. Miss Otago, Monique Cooley, and Miss Auckland, Jennifer Lambly, took the remaining spots in the top five. Reflecting the changing make-up of New Zealand, Miss Böhm hails from South Africa, and had to learn English as her second language after her arrival, having spoken only Afrikaans in her teens. She already holds a diploma in fashion, and is planning to embark on a business degree, majoring in accounting. She would like to have her own fashion label. She had designed many of the outfits that the judges saw during the week. Miss Bennett (Te Arawa), a qualified property valuer with ambitions in property development, entered last year as well, and came runner-up in the 2011 competition. Wellington local Miss Mann, who works for the World of Wearable Art and Federated Farmers, was the crowd favourite. Chair of the judging panel, Lucire publisher Jack Yan, says that each contestant brought a unique set of qualities. ‘They each excelled in different areas, but Avianca had that je ne sais quoi. ‘It might be described as her natural effortlessness, where nothing seemed to faze her. Avianca is best equipped to handle the international setting of Miss Universe, and that helped put her into the top place. Ms Lott says she had found the pageant energizing, with Wellington having turned on spectacular weather for most of the week the contestants were in the city. Miss Böhm will now go to compete in Miss Universe 2012, to be held in December. Pageant owner Donald Trump is yet to make a final decision on the venue. Mr Yan was joined on the panel by May Davis, a former Miss South Africa runner-up experienced in international pageants; Carl Manderson, the director of Salute Hair & Day Spa in Lower Hutt; stylist and fashion editor Samantha Hannah; Danijela Unkovich, Miss Universe New Zealand runner-up in 2010; and New Zealand Olympic team physician Dr Wayne Morris. Wellington designer Shika Braddock judged the eveningwear competition. The Wellington show was streamed live on Facebook by social media agency Catalyst90. It was choreographed by Sarah Melville-Smith. Soprano Sophie Morris performed, while Zeisha Frémaux and One News reporter Matt McLean MCed the event. The Museum Art Hotel provided accommodation and facilities to the pageant during the week.